You don’t need fancy equipment to dry herbs. All you need is a clean paper bag. Harvest your herbs, pop them inside. Roll the bag’s top closed to keep the dust out. And wait. Then do as I do. Move the bag back and forth on the kitchen countertop whenever it’s in the way. A few weeks later, give it a squeeze. If it sounds crunchy inside, you’re probably done. 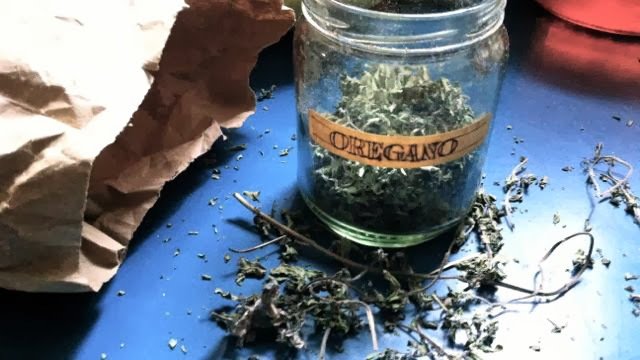 Today, I crumbled my home-grown oregano inside the bag, and poured it into one of our dad’s old spice jars with his hand-lettered label. Dad died 20 years ago next month, so it makes me happy to think there’s still a little part of him in my kitchen. Afterwards, I pulled the last stubborn leaves of oregano off the stems, and my hands smelled wonderful for hours. Try it! Or tell us what easy methods you use for drying herbs. What a terrific idea! I've wondered how to let them sit out and not get dusty. And the place to get paper bags is the LCBO, save the bags from your Thanksgiving wine shopping. Those long paper bags for wine from the LCBO are the perfect shape for herb drying, Yvonne. how did you make that label? How nice to have this little reminder of your Dad in the kitchen. I may give this a try with some of the herbs that I have in pots. It is a shame not to put them to good use.